This past year has been an exciting time for me as a teacher and a blogger. I joined the Teacher Blogging Challenge in January and I never looked back. Last month was my first time noticing the Edublog Awards, also known as #eddies, so I nominated some of the bloggers I’ve been privileged to meet over the past year. 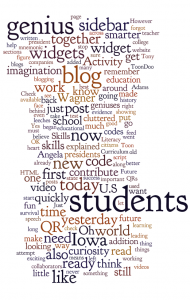 I was also nominated by two of my fellow Teacher Blogging Challenge friends–Tracy and Sheri. Now is the time for voting for your favorites. You can vote once a day on every computer, so you can get all your votes in by December 13, 2011. There are so many excellent new blogs, individual blogs, teacher blogs, student blogs, Tweeters, free web tools and more, so you may need multiple days to get all your votes in! I know I do. For me, it’s an added bonus, as well as thrilling and humbling, to be included on this list of nominated best teacher blogs. Welcome to the blogging world! Some of my blogging teacher friends have been creating resources for new bloggers, so I thought I would contribute my ideas. My simple advice is to get in there and start blogging, find your own way, and enjoy the journey. Although I’ve been blogging for about 18 months, it’s just been in the last six months that my journey has become more engaging and rewarding. First, I became involved in Edublogs teacher challenges. It started with the Kick Start Your Blogging last January. Next it was 30 Days to Get Your Students Blogging, next, with my students, the Student Blogging Challenge in late March through May. Then I even became a guest blogger in the Free Tools Challenge. Currently I am lurking about the PLN Challenge. I’m hoping to begin participating, but, yikes!! There are too many opportunities to take advantage of all of them. However, as a result of the blogging challenges I have tried, I’ve discovered a whole world of educators out there connecting and collaborating. I’ve met some incredible friends like Nancy Carroll, Sheri Edwards, Lyn Howlin, Theresa Allen, Joanne Selig, and Kathryn Trask—educators from all over the world. The second thing that happened on my blogging journey is I realized I was unclear on the purpose of my blog. Was it for personal or professional reflection? Was it to give assignments and write model blog posts for my students? Yes, it was all of those things, and it was a little bit crazy. Along the way it became clear to me that I needed two blogs: one for professional entries and the other for classroom work. 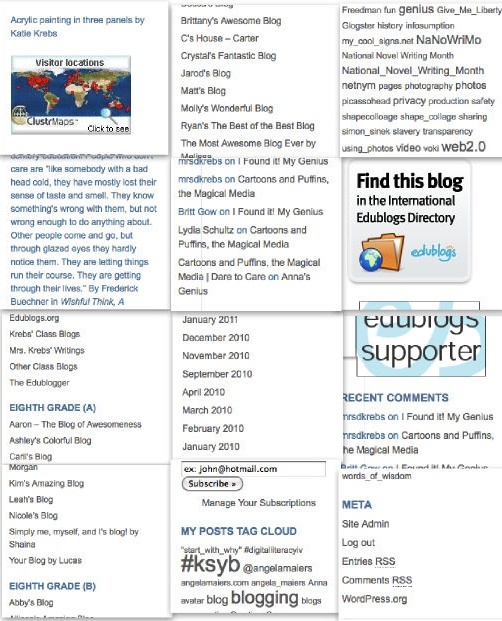 You are reading my professional blog, and you can find my student blogs at http://krebs.edublogs.org. So, my advice is to get started and find your way. Maybe you’ll choose to join a blogging challenge and define your purpose earlier than I did. You are unique and your blogging journey will be too, so have fun with it and good luck! I like that we call graduation “commencement” because commencement literally means beginning. As we graduate from the “30 Days to Kick Start Your Blogging” teacher challenge, I realize it is really the beginning. It is the beginning for all of us new (or freshly spiffed up) bloggers. An interview with my blog started this challenge, so I thought I would end the challenge with a final interview. 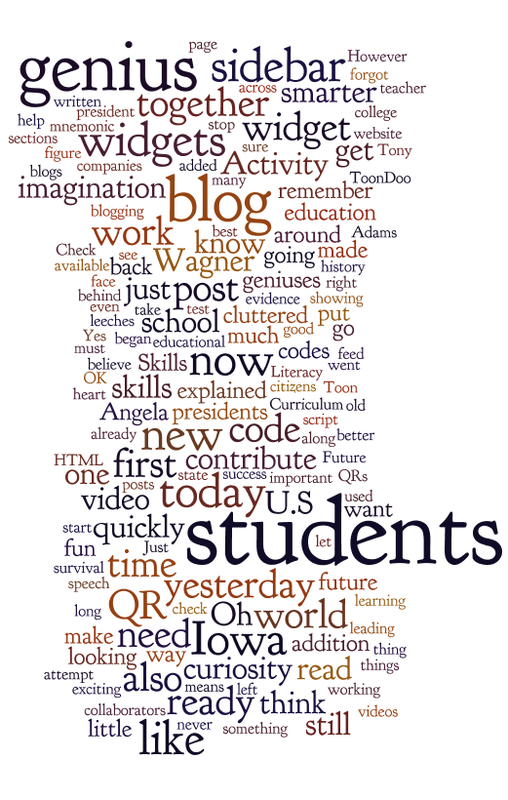 But before my blog comes out, I wanted to show a word cloud of my blog over the past month. I am delighted with the big ideas and topics included. Well, Dare to Care Blog, why do you need readers? Mrs. Krebs and all the fine educators who have been in this blogging challenge learned they have joined a conversation. They believe that they really do have something to offer in their listening to others and in their sharing of their own voices. According to my ClustrMap, in her first eleven months of blogging, she had about 450 visitors. In one month, as she participated in this awesome 30-day professional development program at Edublogs, she had 300+ visitors. From little over 1 visitor per day to 10 per day! Of course, we all know how that happened. Neither she nor I did anything new or exciting. There were no prizes, no gimmicks, her writing skills didn’t improve, nor did she have incredible new insights. It wasn’t the fancy widgets she put on my sidebar or the categories and tags she cleaned up. The only thing that really changed was she joined a community of educators willing to help each other by listening and sharing. It was transformational. Mrs. Krebs and I, her trusty blog, thank all of you! How can we stay networked? How can the conversations continue? I believe it will be more difficult without the regular prodding of Sue Waters, Ronnie Burt, Sue Wyatt, and Anne Mirtschin. However, it will be possible, if educators do a few things. First, join Twitter, if you haven’t already. Follow the four educational leaders above and @mrsdkrebs. Send out tweets when you post a new blog entry. Follow educational leaders and read their blogs. Second, dare to share. (Just a little play on my name there!) Write posts about incredible lesson plans, questions one has, cool new web 2.0 apps, genius student work, and any other professional and personal reflections. And write them regularly! Finally, because there won’t be the handy “Posts of the Week” links to visit each others’ blogs, you’ll need to be proactive in going out to read others’ blogs. Have you found some favorite bloggers already? Add them to your reader or subscribe by email. Or add them to your blogroll and visit them regularly. Why has this challenge been important to you and your blog? My writer, Mrs. Krebs, asked me to yield to her on this question, so she’s taking over. It’s an exciting time in education. According to Tony Wagner, American education is due for a major renovation. It’s happened just once before. Over 125 years ago, our school system was reinvented. It went from a one-room school house model to an assembly-line school system, the same factory model we still have today. American education doesn’t just need a reform, it needs a re-invention. I know it’s true. Students think education is irrelevant to their lives. They don’t believe the stale promise, if you work hard and get good grades, you’ll get a good job. I don’t want to waste any of my valuable time teaching in a way that is irrelevant. I want to be in on the conversation that is reinventing education. I don’t have grand ideas, but I do believe I can be part of the discourse. I am eager to listen and share and reflect. My blog has become a part of that! The rest of my blogging time today was spent with a potpourri of widgets! 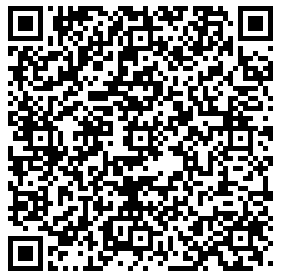 I have seen some interesting things about QR codes, so I made one for the first time. (Is a QR code a widget?) I couldn’t figure out how to capture the HTML code (if there is HTML), so I didn’t put it in my sidebar. 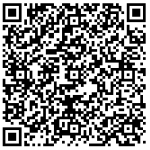 If you have the means to read QR codes, you may be able to scan this and read my profile. I don’t have a device that reads QRs, so I can’t check it out. Check out this video for some amazing educational applications of QRs at McGuffy School District. A good blog post by Kimberly at I Heart EdTech also gives uses for QR codes in educational settings. Yesterday I saved an archive of my blog so I could monitor changes in my sidebar, before and after the big cleanup. I used Photovisi to make a collage. It is a bit mixed up, but I think you can get the idea that it was full of widgets. The link sections were too long, as I had 21 students’ blog links listed. Those were moved to my new class blogs page. I removed extraneous widgets that were there by default, and I followed Sue Waters advice on what were must-have widgets. Additionally, I added a little note about my blog. I didn’t want my sidebar to be long and cluttered again, but I still needed to add some must-haves, and I did—an RSS feed chiclet and a subscribe by email box. In addition, now I have useful categories, newly named and organized, and I kept the tag cloud. I also went back and tagged all my old posts, something I hadn’t done since I started my blog a year ago. 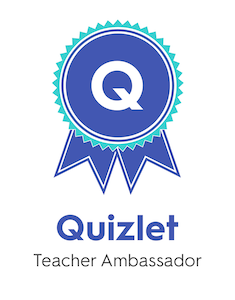 The ClustrMap went to the bottom of the page, along with two other badges I’m proud of—we’re in the blog directory and I’m an Edublogs supporter. I believe my sidebar is still less cluttered today than it was yesterday. Hopefully, it will also be more effective today than it was yesterday. However, as I drafted this post, I stopped midstream and added a Twitter feed widget. My, what fun! OK, I must stop now, or I’ll be back to my meter-long sidebar. But, wait, how about Shelfari? And I’ve definitely been wanting to check out a grocery list widget, a springtime in Paris widget, and the ubiquitous Elvis classics widget. Oh, never mind! Really, I do need to stop widgetizing this blog! What do you think about my new sidebar? Did I improve it with Activity 7? Any suggestions for making it better? Do you think it’s still too cluttered? I would welcome any comments from my fellow #ksyb friends! In addition, if you can read a QR code, will you please let me know if mine says anything? OK, here I go again, spending way too much time having fun with all the new webapps available! ToonDoo and Blabberize were both very entertaining! 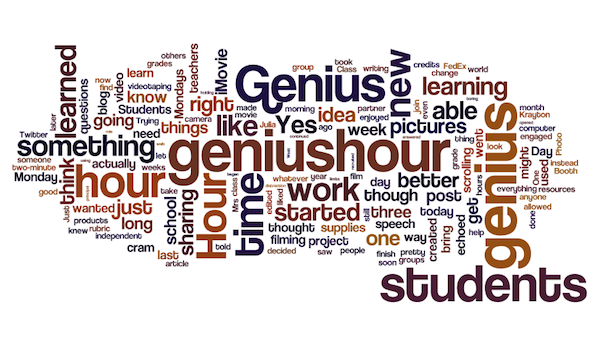 My post will be a short one today because I have been writing other posts about my blogging addiction, my genius students and former genius student. I love teaching and learning! So much to learn, so little time. I could stay up all night again learning new things in Activity 6 of the Kick Start Your Blogging Teacher Challenge, but I must go to bed. That way I can start dreaming about Activity 7 and widgets, which just came out. Photo: By the U.S. Fish and Wildlife Service – Northeast Region. They have made it available with an Attribution 2.0 Generic (CC BY 2.0) license. That means I was free to share and remix, which I certainly did. The puffin in the original photo was very stately and handsome, and he wasn’t blabbering at all. I’ve also included a couple previously-created embedded media. I use SchoolTube to upload my videos. I like it best because all the videos are uploaded to a school site, with teacher moderators. Prezi is an awesome webapp. I’m still trying to figure it out. That non-linear feature has so much potential! Here is one attempt.